Be prepared for surprise Regulatory Inspections. Piles of trash in your kitchen, utility rooms and other areas can be eliminated! 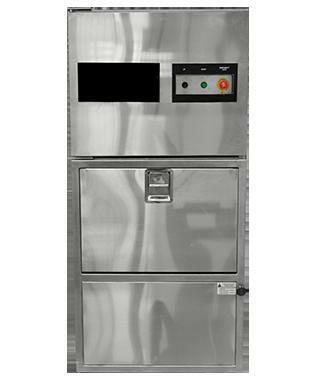 Trash Compactors that have extremely high compaction capabilities (such as this) will result in highly reduced waste hauling requirements as well as huge savings in trips to the dumpster by employees. In addition, there are many added benefits such as improved security, easier and improved housekeeping, fire hazard reductions, superior sanitation, not to mention the overall quick paybacks and tax advantages. When you use a compactor to compact trash right at the source the benefits of streamlining your waste processing and waste handling routines can also result in productivity improvements and labor savings in other areas since labor is utilized more effectively (versus tending to trash). In short, a compactor can be the driving force for huge gains in overall productivity. By combining a compactor with a cart all in one machine, this innovation eliminates one of the biggest obstacles to compactor implementation (which involves the decision regarding the best way to get the heavy trash cubes from the compactor into the dumpster). Employees don't feel the weight since the compacted trash is carted and lifted into the dumpster with a liftcart. .
To learn more about how to evaluate your particular waste processing and waste disposal situation read our General Overview. Electrical Control Panel continuously monitors operation and safety features. Stainless steel construction allows for easy cleaning, great appearance and long-lasting durability. Compaction Plate 19" L x 25" W"